Over the last few years we've seen the industry of the connected self morph and change. As is the natural process of evolution, only those who adapt survive, and there's no better way to get a sign of the times than to look to the startups out there in 2018. From re-thinking how we use VR to granting new health insights to help us be our best selves – and to saving lives. Heroes have fallen, promising startups have been absorbed by industry giants, and there has even been the odd unlikely return. But there's no doubt that this industry is as exciting as it's ever been. 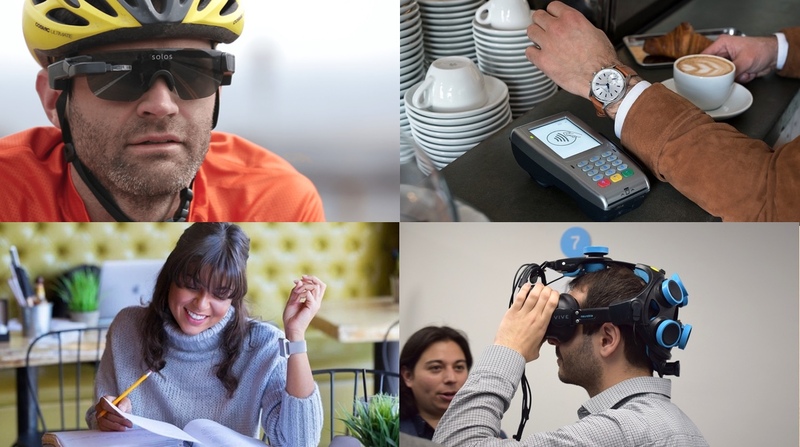 There are many exciting startups with bold, innovative ideas in wearable tech, health, VR, AR and more. Below, we've rounded up 20 that we think you should be keeping an eye on in 2018. These folks aren't messing around. In no particular order, here are the startups to keep an eye on this year. Motiv makes building smart rings look easy (it isn't). Its first product, the $199 Motiv Ring, is a sleek 'n' discreet 24/7 sleep, activity and heart rate tracker that's waterproof and has a three-day battery life. The first big update brings support for Android users, a 'find my phone' chime, social sharing in the Your Circle app and even a new Alexa skill so you can get stat updates and advice from the Echo. Now available to buy on Amazon or try on in b8ta stores in the US, it's not a perfect product but it's also hard to overstate just how impressive a task this SF based smart jewellery startup – led by Tejash Unadkat – has carried out. Just look at the trail of malformed and misshapen smart rings in its wake for the proof. As the wearable market grows and the big boys and girls of the tech world continue to invest billions of dollars into deep health, breaking into the world of wearables is going to become increasingly difficult for startups to manage. zGlue wants to change that with its new zOrigin platform, which essentially packs everything you need to create a basic fitness tracker into a tiny system-on-a-chip. We're talking Bluetooth LE radio, accelerometer, heart rate sensor, temperature sensor, vibration monitor, a battery and a Cortex processor. If it succeeds, zGlue is also looking to make it easy for small companies to create custom chips. Any interested company would just have to request what it wanted in its wearable, like a barometric altimeter or a carbon monoxide sensor, and zGlue would work to make it possible. If it gets what it wants, it could even be the catalyst to an indie wearable revolution. This Swedish startup is filled with veterans from Sony Mobile, and includes people who helped build out accessories like the Sony SmartWatch. The team has taken its expertise and focused it sharply on the world of hybrid smartwatches. And thus far, it's all been a stunning success, with Kronaby earning a Highly Commended nod at the 2017 Wareable Tech Awards. The startup has also started building out its smart features, partnering with Barclays' bPay to bring contactless payments to its hybrid. It's also not shying away from pushing forward, as it announced a whopping 11 new models at Baselworld this year. From 2017's list – where are they now? This time last year Vue had us excited for its stylish smartglasses, which track activity and use bone conduction technology to alert you to notifications. Sadly, the road to production has proven to be longer and more arduous than expected. The team is currently working to get these off the assembly line, and anticipates shipping will start this July. The company behind this brain-zapping technology has gone from strength to strength since this time last year. In January it secured $13m in Series B funding and it's just announced a big partnership with USA Cycling for training athletes. AR company Avegant has had a rockier few months, laying off more than half its staff in 2018 and replacing its CEO. However it's still raising money, and going forward the strategy appears to be to partner with hardware manufacturers, rather than sell its devices to consumers as it did with the Avegant Glyph. Kronaby isn't looking at a full-on smartwatch yet, as it wants to see how other manufacturers figure out battery life and play with digital displays. But it is looking at how it can fit voice control into its army of hybrids. Could we one day see Alexa or Google Assistant in a Kronaby? You can't count it out. While the dream of augmented reality is as thrilling as ever, the road to get there is paved with jagged rocks and sinkholes. Not only do you have to find a way to build a good-looking, light and powerful AR headset, you also need to be able to develop a load of content to make people actually want to wear your headset. While Apple and Google can leverage their massive smartphone businesses to build out AR, ANTVR is taking a more novel approach. It's essentially building a stop-gap device, an AR headset that runs converted games from SteamVR. That's right, it lets you play VR games in AR. Trust us, we've seen it working. The idea is that by getting SteamVR developers thinking about AR, it can help jumpstart a small library of AR games for the future, giving it a nice selection of titles from a popular platform. One day, when ANTVR can deliver on its dream of a Lightfield-based AR headset, it'll already have a suite of content available to play – one that will benefit other AR companies too. No, you haven't been transported back in time. It's 2018 and Withings is back, following a brief stint under Nokia. The Finnish company snapped up Withings in 2016 with a hope of bolstering its health endeavors, but sadly things didn't work out, and Éric Carreel, the co-founder and former chairman of Withings, is buying his company back. Carreel is going to relaunch the brand by the end of 2018, putting it back in the 'one to watch' category. We're promised new devices and new innovations, but what we really want to know is whether the Steel HR smartwatch is getting rebranded again. "From now on we must concentrate our efforts on developing tools capable of advanced measurements and the associated services that can help prevent chronic health conditions," said Careel. We're excited to see what Withings 2.0 looks like. All we can say is, don't underestimate it. SleepScore Labs impressed us with its non-contact sleep tracker, and in 2018 it's turning to wearables. It recently snapped up the Netherlands-based digital health company Sleep.ai, which makes wearables for detecting snoring and teeth-grinding. It's also turning to sleep apnea, something that many of the big names in health tech are currently chasing, as another life-changing insight it may one day deliver. "We are only at the beginning of what we can do to help improve people's lives by diagnosing and improving their sleep health, helping them get better treatment and outcomes," said Michiel Allessie, Sleep.ai's founder and CEO. Sleep is the new hot thing for health tech companies – and SleepScore Labs is one to keep an eye on. It's a good time to be Leaf Wearables. The smart jewellery and safety tech startup, based in Delhi, India, was just awarded the $1 million Women's Safety X Prize aimed at discovering a wearable emergency trigger for less than $40. We first spoke to the team back in 2015 about its device to prevent sexual assault in particular. Its mission remains the same: to make one billion families safer. Safer is also the name of Leaf Wearables' smart necklace, which looks like regular costume jewellery (and can also be worn as a ring) but connects to the user's smartphone via Bluetooth to trigger alerts to friends and family when needed. Cleverly, it will send a text message when your phone isn't connected to the internet. Co-founder Manik Mehta ultimately wants to see a neighbourhood-led emergency response system. Move over, Swiss watch industry, it's time for the Italians to shine. And with the backing of almost 17,000 people and a whopping €3,534,663 raised through Kickstarter last November, Filippo Loreti is whipping up a storm. Well seasoned in the field of 'dumb' watch production, the company recently turned smart and offered the crowdfunding community a Renaissance model, a hybrid which tracks sleep and activity while also giving you notifications and music control. Since the company is in the process of rolling out a new collection of dumb watches at the same time, shipments for its hybrid smartwatch have yet to begin, despite an initial goal of April. The company indicates that the units are still with the manufacturer, but it's expecting an update soon. But since it's already onto its second wave of shipments for standard models, things appear to be motoring along nicely. We'll be looking to test out the Renaissance once it lands and see whether the crowdfunding hype was justified. If you've ever been at a festival and struggled to pick out the sound because you're standing hundreds of yards away from the stage, you'll know it can be pretty frustrating. But it could also soon be a thing of the past if Peex has anything to do with the matter. The company is soon set to launch a wearable that lets users pop headphones in and augment the live sound to their taste. Want to hear a bit more bass? Crank it up on the app. Can't make out the vocals? Slide them to the max. The device has already gone through some pre-testing and is set to launch later this summer, working with artists and taking audio feeds from their production in order to distribute into different mixes in real-time. We have our doubts whether the idea is suited to every live music scenario, but the idea is novel, fascinating and could eventually help change how we experience concerts. Many startups have incorporated fitness tracking smarts into a wearable that sits on the finger, or provided a device which acts as a discreet SOS solution, but very few have yet to go all-out and try and do it all. After recently raising $543,434 through Kickstarter, though, Xenxo's S-Ring looks set to do exactly that. The Indian startup told us in May that SOS alerts are the key selling point of the ring, but it also manages to pack in support for NFC payments, the ability to make calls through the built-in speaker and microphone, integration with Google Assistant and Siri, a silent alarm, data storage, gesture control for music and even step counting. If Xenxo's able to pull it off, it'll likely wind up being the most feature-packed smart ring we've ever seen. But this isn't easy technology to develop and bring to the masses, as many other startups have discovered. We'll get a better idea of whether it's the real deal in November when it ships to backers, but initial signs are encouraging, and the device is already on its way to being manufactured. There's a lucrative future for tech companies getting involved with diabetes, but the holy grail of non-invasive, accurate glucose monitoring is one that might never be achieved. That is, unless LifePlus has cracked the code. The startup made waves this year when it emerged to announce it had successfully built the first continuous non-invasive wearable for glucose tracking. LifePlus isn't using new sensor technology, but rethinking the use of existing sensors to isolate glucose in the blood. This has yet to be proven in practice, but the big question is whether it can track accurately enough to advise on insulin dosage. The naysayers don't think it's possible, but the jury's out on LifePlus until we can see its wearable working later this year. We're promised it won't be long. We often talk about smart clothing as an alternative to the smartwatch, but Nanowear is doing things a little bit differently – it's going above and beyond what wrist-based gadgets can track. The startup has developed a medical-grade textile, SimpleSense, capable of capturing millions of signals on the skin and giving it the potential to unlock biometric insights to help wide-ranging medical conditions. Its first battle, though, is taking on congestive heart failure, monitoring patients through the likes of ECG, heart rate variability, respiratory rate, actigraphy, impedance cardiography, thoracic impedance and cardio-phonography to help keep them out of hospital. The company is currently going through clinical trials that will test if its smart garments can accurately diagnose and monitor the heart condition, and we expect to hear plenty from Nanowear in healthcare and beyond over the coming year. Swimming wearables might lag behind running and cycling ones for groundbreaking innovation, but the work that this creative engineering and product design studio is doing to change that means exciting stuff for pool lovers. Born out of co-founder Julian Swan's search for the ultimate wearable for triathlon training, Swan sparked the idea of SwimAR. The heads-up display that can attach to most swimming goggles uses Sony's holographic display technology to provide a transparent display for swimmers, allowing them to view a host of metrics in real-time – which includes overall time, split time for the last lap and number of laps. There's also talk of a GPS version as well. While its crowdfunding project has been put on hold, it does have a working prototype to show that the concept works in the watery depths. It's currently taking a little extra time to perfect its wearable before making it available to swimmers. What if you could control virtual reality with your mind? That's the premise of Neurable's brain-computer interface add-on for VR headsets. Rather than EEG, Neurable uses signals known as event-related potential (ERP) signals, which measure user response to stimuli. The result is essentially thought-controlled VR that could have significant impact on gaming and well beyond. It reads four emotions: valance (pleasure, displeasure), arousal (excitement), liking and dominance (how in control of the situation you feel). In 2018, the technology is being put in the hands of developers to see what they can do, but already the results are promising – and incredibly exciting. Embr Labs is another startup we've been keeping an eye on for a few years and it's almost ready for primetime. Founded as an MIT spin-off in 2013, its clever connected heating and cooling bracelet – the $299 Embr Wave – raised over half a million dollars on Kickstarter at the end of 2017. The crowdfund units are going out in two batches, in February and July, and it'll go on sale properly this November. The team of temperature tweakers isn't stopping with one wrist cuff, though. In Embr Labs' future lies potential applications of its patented technology in fields like virtual reality, entertainment and even non-verbal communication. Women's health tech experts Ava are going from strength to strength. It just closed a big $30m funding round and announced the 10,000th pregnancy from users of its fertility tracking bracelet since July 2016. The sensors in the bracelet, which is worn at night, are able to detect the 5.3 days in a woman's menstrual cycle that she is fertile. The new funds will be used for R&D into women's health tech products and apps for all the stages of a womens' "reproductive life", including getting to know their cycle, preventing pregnancy and entering menopause. Ava also continues to support and invest in clinical trials on the accuracy of its tech after a study last year in Scientific Reports. Ava is a great blueprint for health tech – tap into new areas, listen to your customers, prove the science. Based out of Redmond, Washington, Coros first came to our attention with its smart cycling helmets which put safety first. Most recently, it's decided to venture into the world of sports watches, which is a bold move when the likes of Garmin, Polar and Suunto currently dominate proceedings. We haven't seen anyone since TomTom really give the big three something to worry about, but with the satnav maker having exited the wearable space, this could be the opportunity for someone else to step in and Coros Wearables may be the one to shake things up. Its new Pace sports watch has clearly been inspired by Garmin's sports watches in many ways and while newcomers (including TomTom) have tended to let us down on software, things are more promising with this startup. It's also focused on the features that sports tracking people care most about, and that's reason alone to suggest that this is one startup to definitely keep an eye on. Helping us move on from a Google Glass world, Solos is all about bringing AR to cyclists. After a successful Kickstarter campaign a year ago, its smart cycling glasses went on sale in 2018, and while the $500 wearable doesn't come cheap it does promise a wealth of features to make it the ultimate cycling companion. It works with Android and iOS smartphones and even Wear OS smartwatches, serving up rich fitness metrics that can be displayed in front of you and audio prompts to give you turn-by-turn directions. There's even voice control for that true hands-free experience. If you had doubts whether Solos was on to a winner, it was tested by the US Cycling team before they rode out at the Rio Olympics. If Solos' goal was to prove that augmented reality and smartglasses can have serious appeal then it's certainly done so, and with the ability for its specs to get smarter, we wouldn't be surprised if this is not the startup's one and only venture into wearables. Cyclists have had power meters to govern their training for years and in recent years Stryd has been trying to bring the metric to running. It's already launched a series of footpod sensors as well as a heart rate strap to deliver power data as an alternative to heart rate-based training. There's a dedicated Stryd app on Garmin's Connect IQ Store, making it easier for more people to run with power. Meanwhile Stryd's partnership with virtual training platform Zwift means it's working with other big names to bring its wearable tech to the masses. Sure, getting to grips with the nature of power and how it can benefit your running takes a bit of time, but if you are convinced by it, then this is the startup to help you make sense of it all. What if wearables could help you pick the perfect running shoe? That principle is at the core of what UK-based company Dorsavi is trying to achieve, using wearable sensors, software and algorithms that objectively measure and analyse the way we move to help identify which running shoes you should actually be wearing. It's already worked with a host of elite athletes, professional sports teams, physiotherapists, chiropractors and coaches for injury prevention, rehabilitation and performance enhancement across a wide range of sports. It could potentially revolutionise the way we pick our footwear out in the future as well, ensuring you have the ones that are best suited to your body. We tried Dorsavi's tech out and are convinced it's onto something really big here. Words by: Sophie Charara, Conor Allison, Hugh Langley, Michael Sawh, Husain Sumra.